Trick out your '07-Current Toyota Yaris Two (2) Door Liftback with this simulated easy-to-install Window Louver decal kit. These decals are precut, apply directly to the Liftback's rear side glass window panels and are available in a wide variety of colors. The design of the cutouts give the decals a 3-dimensional appearance and make the vehicle look great! 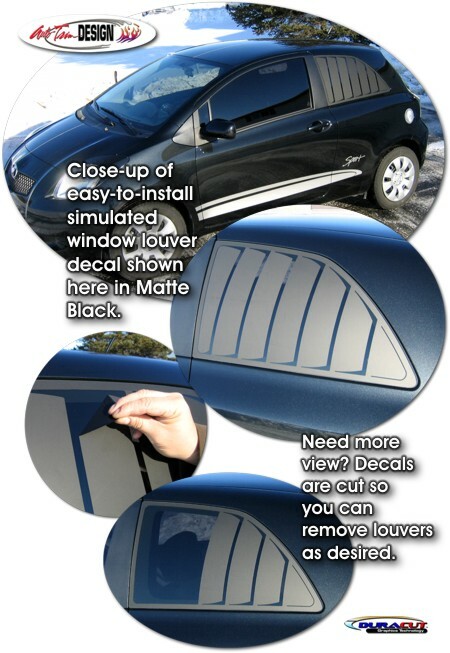 We've even cut the decals in such a way that they can be customized for increased view. The first four (4) louvers from the front can be removed as desired (can only be removed once) for more glass exposure. Two (2) piece kit (one  for each side) is made specifically for the '07-Current Toyota Yaris Two (2) Door Liftback and will not fit any other vehicle.